First-hand encounters with the past inspire students to learn more about our history, while supporting important in-class learning objectives. Field trips where students see, hear, smell and touch life in another century are great ways to instill a life-long love of history in your students. Field trips include an animated guided tour of our centuries-old fortifications and an audience with a soldier who demonstrates the workings of a flintlock musket. Hours: The Fort is open year-round from 9:00 a.m. to 5:00 p.m. School tours are available during these hours. Reservations: Please make your reservation at least two weeks in advance by calling (716) 745-7611 ext. 223. When you call, please provide the date and time of your proposed visit, group size, grade level, contact information, number of classes and special requests. We will then send you a confirmation. Rates: School group admission to the Fort is $8.00 per person (unless otherwise listed). One teacher/chaperone per ten students is admitted free. Admission fees are payable the day of your visit. We accept cash, checks and credit cards. To expedite your entrance, please have one person pay for the entire group. Call us at (716) 745-7611 for other payment arrangements. 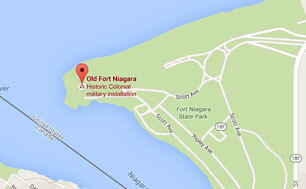 The early history of Fort Niagara is full of exciting stories. Native people, explorers, soldiers, diplomats, traders and settlers all played a role in writing Niagara’s story. 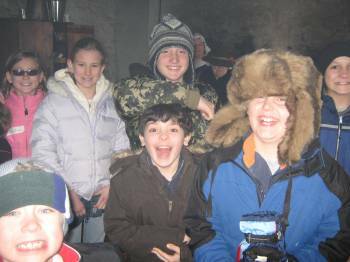 You can introduce your students to some of them at Old Fort Niagara this spring. Flintlocks and Council Fires is a living history program that traces the history of Fort Niagara and its people over a 75-year period; from the days of the French construction of the Fort through the devastating War of 1812. Along the way, your students will meet French, British and American soldiers, Native American diplomats and civilian artisans. The program includes a guided tour of the Fort, with stops at interactive learning stations. Students will learn how battlefield technology worked, how people living on the frontier were fed, and how Native people and Europeans met in council to resolve differences. Once you have registered for a tour, you will receive pre-visit materials including activity booklets for your students and links to online videos about the characters your students will meet at the Fort. (Available April 15). The program runs daily (M-F) from May 13-June 14. Call (716) 745-7611 ext. 223 now to reserve your space or email Carrie LaFlair. Please note that this program is full for the 2019 spring season. Please consider coming for a regular field trip during our Flintlocks and Council Fires program described above. In this special program that focuses on the American Revolution, students infiltrate a British fort to gather information for General Washington. Students learn about rebels and loyalists, Native American views of the Revolution, refugees, artisans, and the impact of the Revolution on the New York frontier. Call (716) 745-7611 now to reserve your space or email Carrie LaFlair. Please notify us of changes in your arrival time, etc. Reserved groups who fail to arrive without notification are billed for tourguide costs. Wheelchairs are available on a first-come, first-served basis. For those unable to climb stairs, a virtual tour of the Fort is available on a laptop on a first-come, first-served basis. How to find us click here. Please keep your group together and follow the instructions of your docent.